Muslins and/or Flannel Fat Eighth Mini Pencil Paks! A beautiful combination of Christmas/Snow-themed primitive and country colors! by us here at Cottage Threads. 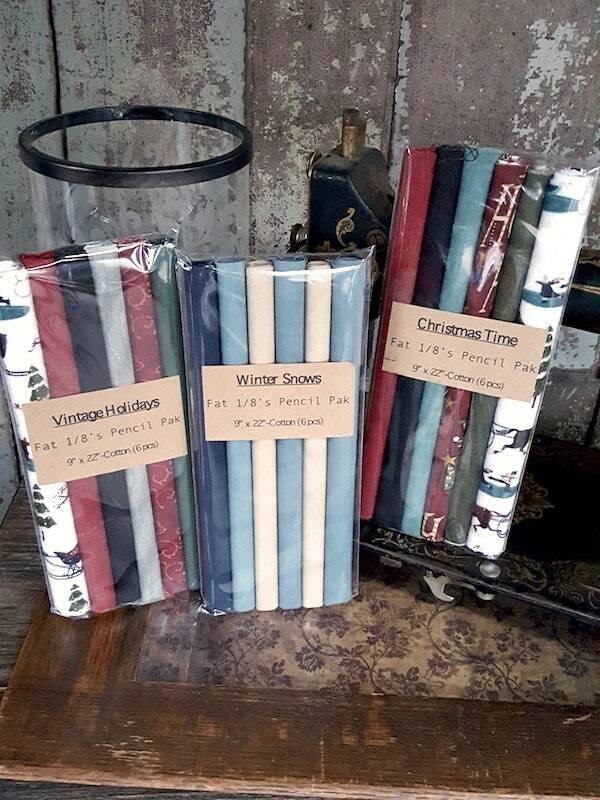 This listing's mini collections are "Christmas Time", "Winter Snows", and "Vintage Holidays". Contains: 6 Fat 1/8's per pak. Each piece measures approximately 9" by 22". All fabrics in this Pak are 100% cotton. Each piece is new, off the bolt, quality muslin or flannel fabric! Colors may vary slightly due to different computer screens. Pencil Paks are great as gifts for that special quilter in your life, or yourself for all the many projects that need just a little piece of fabric here n there! A great way to build up a stash of color and variety! And they make great Stocking Stuffers too!! !